It's easy to see why The Night of the Hunter, Charles Laughton's sole venture in directing, wasn't celebrated upon its release. Along with an unsavory depiction of religion's hypocritical power and the terrifying ordeals that two children endure in the wake of their father's execution, the villain -- a switchblade-wielding, tattooed "preacher" -- struts along with what's best described as maddened God-driven fanaticism. While the mid-'50s acknowledged the romance in David Lean's Summertime and Delbert Mann's Marty, an adaptation of Davis Grubb's novel seemed too ugly and candid, and thus fell -- along with Laughton's confidence as a director -- under the pressure of box-office failure. Now, however, Laughton's masterstroke of densely-themed suspense still retains the same affective, disturbing edge, only its audience has changed. The context is still troubling, yet the growth in our perception of allegorical and socially-pertinent art, and of Laughton's skill in the director's chair, has affirmed its stature as both an irrefutable parable of faith and a thrilling powerhouse of a horror film. It starts with a promise. As Ben Harper (Peter Graves), husband and father of two children, stumbles to his home with the police chasing behind while he carries a smoking pistol and $10,000 in cash, he asks his two children -- John (Billy Chapin), the eldest, and Pearl (Sally Jane Bruce) -- to keep a secret about where the money's hidden. He doesn't do it so he might have the cash after some time in jail, but so that the children won't have to be penniless when they grow older. But after Ben's thrown in jail following a death sentence, he lets the secret slip to a deep-voiced stranger in the bunk above him -- Reverend Harry Powell (Robert Mitchum). Powell, however, isn't your run-of-the-mill preacher; with tattoos on his fingers that read "LOVE" and "HATE" and a switchblade in his pocket, he's clearly a demented sort under the delusion that his violence echoes the wishes of a higher power. And now he has knowledge of a fistful of cash and a weeping widow, while we have knowledge of Powell's penchant for slaying women as "abominations" with his switchblade as his flaming sword. 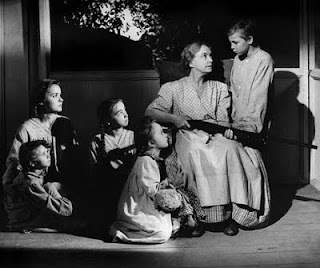 The Night of the Hunter, as soon as Powell arrives at Cresap's Landing, simmers into an incisive depiction of how fanaticism can spread like a disease when powered by a false prophet. The demented "preacher" starts in with the story about the forces of good and evil, gripping his tattooed hands together in a simple-minded display that, naturally, woos a crowd in a candy shop. Powell then makes his presence known at a local picnic, where the townsfolk admire his physical appeal and his stability -- and the candy shop owner suggests he become a viable suitor to the widowed Willa Harper (Shelley Winters). Nobody thinks to look into his credentials or double-think the man's intentions, showing how people are willing to unabashedly trust the words of a man spouting God's word. That manipulation of believers based on their unflinching devotion remains an insightful social dig, perhaps even more so in our own current climate. And it's not just applicable to religion, but any sect of people who piggy-back on magnetic soothsayers. Laughton depicts humanity in a frightening light, heightened by a surrealist style that shapes the film into a nightmarish neo-realist fantasy seen through the eyes of innocent children. The Night of the Hunter pulls influence from German expressionist films, both in thematic context and in artistic focus, to create an unsettling balance between a socially pertinent depiction and a work of frightening whimsy, one where the audience both acknowledges the surrealism of the situation and the disturbing reality with which it originates. Elements of The Cabinet of Dr. Caligari and F.W. Murnau's Faust can be spotted in cinematographer Stanley Cortez's gothic rendering of the eerie shadows and slanted angles of the rustic town of Cresap's Landing, which bolsters Powell's presence as a brooding force at the town's heart. It's gorgeous but also tremendously bleak in its visual demeanor, yet that only adds to the mood, particularly when considering that we're looking out through a child's eyes. There aren't many villains more frightening, at least on a human level, than the booming, silver-tongued Harry Powell. Robert Mitchum's poise in the role is nothing less than staggering, exaggerated to just the right degree that one might picture as a child's memory, while the communication with his "higher power" turns unsettling within poetic, zealous lyrics -- and they obviously unsettled Mitchum as well, gauging by some of his reactions during outtakes. 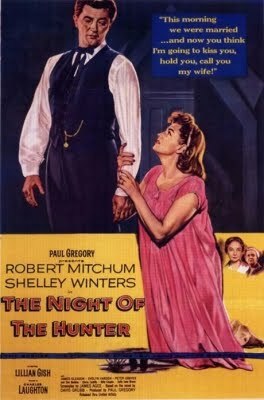 His frightening nature takes on a myriad of silhouettes; when he's tending to the flock at Cresap's Landing, his power to roil them up over contorted beliefs builds into a disheartened, stomach-swelling portrayal of humanity, while his influence over Willa's parenting skills and repressed sexual satisfaction paint him into a terrifying presence. His confusion over the number of widows he's accrued in his God-ordained pathway really hits the iron hot. Powell takes on his most alarming form in the eyes of the children, though, which becomes the crux in both Laughton's film and Grubb's book as the storyline approaches John and Pearl's trip downriver. Their boat trek, a cat-and-mouse chase sparked following Powell's contorted, vile authoritative aggression, leads into a collage of images involving frogs, rabbits, owls, and other critters along the moonlit riverbank, and it's a striking flow of sequences -- with Pearl's singing as a backdrop -- that heightens the unsettling tone with a primal essence until they reach the end of their journey. There's a moment when John catches sight of Powell galloping on his horse from a distance, while hearing the sound of his singing voice, which gathers together the expressionist visual flare and the weighty dread behind the character's energy, and it's simply cinematic bliss. Perhaps the most gratifying thing about The Night of the Hunter is the way the central themes and dramatic devices spin full-circle towards a potent reflection on everything that's happened, all while retaining an effective chilliness as a thriller. John and Pearl stumble onto a stranger along the riverbank -- a hardened, sharp, shotgun-wielding gardener named Rachel Cooper, played by silent-era starlet Lillian Gish -- who isn't as susceptible to the woo of Powell's manipulation, even amid his booming doom-'n-gloom and his haunting singing voice. Seeing Rachel as Powell's contrast, a nurturing guardian who tells lyrical religious tales from the Bible with affirmation instead of hellfire, compounds the ideas of redemption and innocence into an almost Canterbury Tale-like fable amid their fiery collision. 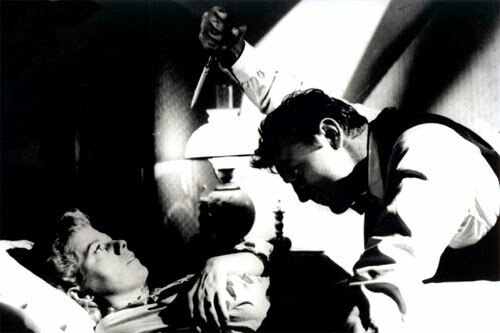 It's a shame that Laughton's sinister style and Mitchum's performance were overlooked upon the film's release, because the brimstone at its core -- perseverance of innocence and true purity of faith -- burns brightly in this cautionary fable that's controversial and divisive in all the right ways.